Get frisky on Sushi Cat Slots, the 5 reel 25 payline slot game with Karaoke and Bump Bonus rounds to boost your winnings! Multiplier - up to 100x Triggering Bet! Hungry to win? Play Sushi Cat Slots for the chance to take home huge cash prizes! This unique slot game will keep you entertained for hours, featuring fun bonus rounds and cute animations. Sushi Cat is a 5 reel 25 payline slot machine game with a unique design that gives it an arcade game feel. Don't let the design fool you, though - there's plenty of dosh to be won! You can win up to 100 times the triggering bet with the Karaoke Feature, activated by three or more Sushi Girls appearing across the reels. Get three or more Train symbols and the Train feature is activated, where you can also win up to 100 times the triggering bet. Free games are triggered by three or more Chef symbols appearing anywhere across the reels, and with the Bump Feature you've got the chance to win up to 25 free games! A single Free Game can also be won when three or more Fish symbols appear anywhere on the reels. What's more, prizes are doubled when Wild substitutes in a winning combination. Have you worked up an appetite yet? 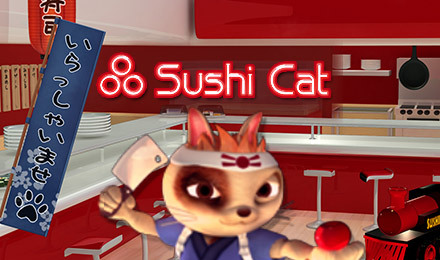 Play Sushi Cat Slots to win some delicious dosh!